As you've probably heard, Pastor Billy Graham went home to be with the Lord yesterday morning at 99 years of age. 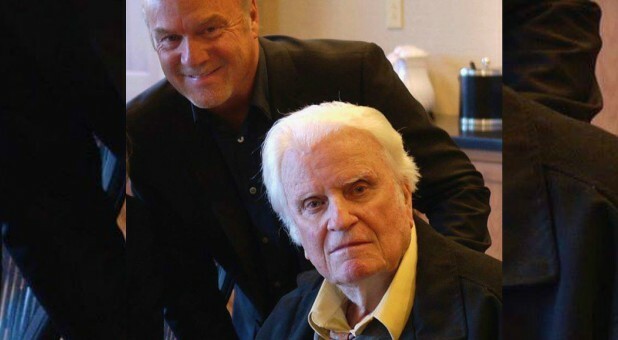 Years ago in Portland, Oregon, I had the opportunity to accompany Billy Graham to one of his crusades. On a night of what would be a record attendance, I drove over with him to the event. As I recall, Billy's long-time friend T.W. Wilson was driving. I sat in front, and Billy and his son Franklin were in back. When we arrived at the stadium and Billy made his way to the platform, I was struck by the expressions of awe on people's faces. It was as if Moses were passing through their midst. Billy, however, seemed completely unimpressed with all the adulation. He got up and delivered a powerful message, and then, when he was done, we all piled into the car to drive back to the hotel. As a fellow preacher, I felt like I should say something nice about his message that night. So I turned around in my seat, looked at him in the back seat, and said, "Billy, that was a great message tonight." "It's just gospel," he replied. I turned back around, thinking to myself, I was just trying to offer him a compliment. Maybe I should say something more specific. I turned to the back seat again and said, "I really liked the part where you said, 'He can re-sensitize your conscience.'" He looked at me and said, "Well, He can." I turned back around again and thought, Okay, fine, I'm not offering him another compliment! How can a man be in the position he is in and not have that go to his head? It's been said that it takes a steady hand to hold a full cup, and God has trusted him with so much responsibility through the years. In all my memories of him, Billy just liked to sit around and chat and be a regular person. He would be as interested in you as you were in him, which didn't make any sense at all to me. Why would he want to ask my opinion or listen to what I had to say? If there's one word that sums him up, it would be "gracious"—but I would have to add "humble," too. Billy has always been gracious, not just to a noted person like a president or a celebrity, but just as gracious to a person he just met in a restaurant or on the street. He always seems to take a great interest in individuals, and I think that has been one of the secrets of his success. A person once wrote that if you ever see a turtle on a fencepost, you know someone put him there; he didn't get there by himself. I think Billy Graham has always recognized that. When it was all said and done, he was just a farmer from Charlotte. He was raised on a dairy farm, and he would say, "I'm just a country preacher." People would dismiss this as though he didn't mean it, but in reality he did. He was just a country preacher who was elevated by God to a level that very few others have ever been to, if any. I remember spending some time with him after attending a board of directors meeting for the Billy Graham Evangelistic Association. It was just prior to the release of a major biography on Billy, and he was concerned about what had been written about him—as anyone would be. After all, you never know what the author will write about you, who they have talked to, or even if they're going to be completely truthful. At one point in this discussion I said to him, "Billy, you have lived a life of integrity. You are a man of God. You have nothing to be embarrassed or concerned about. I know this biography will be fantastic, because you've lived a wonderful life as a follower of Jesus Christ." And sure enough, it was. But the fact that he'd even have this concern showed that he had his insecurities just like anyone else. Nevertheless, he had no skeletons in his closet to fear, and he has maintained a sterling reputation through all his years of ministry. One time, after one of his crusades, we drove over to his hotel. We were sitting around, and Billy disappeared for a few moments. He came back into the room wearing his pajamas and dress shoes. (I guess he didn't bring his slippers.) Someone had given us some roast beef sandwiches to eat after the service. At that point, they were hours old and stone cold, but we took them out of the bag and just sat around munching on them, talking about this and that. I watched Billy eat his sandwich, completely content in his pajamas and dress shoes in a room with people he was comfortable with. He wasn't one of those people who would want to have a big party, a big celebration, or a fancy dinner. Billy was just happy to eat his cold sandwich and be around friends. As I've reflected on it, I feel that he is the most Christ-like person I've ever met—though not without his human foibles and shortcomings. He would be the first to admit those. If Billy Graham had a weakness—and of course we all do—I think it would be his excessive kindness, allowing people to exploit his goodwill to their own benefit. He was a very intelligent man, but he was sometimes so accepting and loving toward others that people would take advantage of that. But if you're going to have a human weakness, that's a pretty good one to have, all things considered. Billy Graham preached about love, and he lived it. He loved his wife, Ruth, with all of his heart. I've never seen a husband and wife more in love than Billy and Ruth, yet they would have their little disagreements like any couple. The way they would speak to each other, however, was just utterly charming and fun to watch. Ruth was in every way his equal, with a great wit and sense of humor, and you could tell he loved to be around her. When Ruth was very ill and dying, I remember being in their home. Ruth was in a wheelchair, and Billy was seated next to her. A friend of ours, Dennis Agajanian, an amazing guitarist who appeared at many of Billy's crusades, came by to visit, and was asked to play the "Hallelujah Chorus" from Handel's Messiah. As he played, I found myself watching Billy and Ruth. Ruth's face was radiating light, and Billy was just looking at her, smiling. They didn't say anything. But after it was done, Ruth said, "That was a song they played on our first date." As it turned out, on their first date they saw Handel's Messiah. That was a special moment I'll always remember between two people who were completely in love with each other. I thank God for Billy Graham and his legacy, and pray that God comforts his family during this time.